Due to advances in veterinary medicine and a focus on preventive care, dogs and cats are living longer than ever. As your pet ages, his or her lifestyle needs change and risk of disease increases. For these reasons, we are pleased to offer a senior wellness program designed to maximize your pet's health and life expectancy. The "Over Forty" senior wellness program consists of a thorough physical examination by a veterinarian. Laboratory tests on blood and urine are performed to check the status of your pet's kidneys, liver, thyroid gland, and blood cell counts. An EKG is performed and read by a cardiologist to assess the condition of your pet's heart. Finally, radiographs (x-rays) are taken to evaluate the chest and abdominal cavities of your pet. All of the test results are reviewed by a veterinarian and recommendations are then made regarding diet, nutritional supplements, exercise, the possible need for medication or alternative therapies, and possible further testing. Please ask our receptionist or one of our veterinarians for further details about our "Over Forty" senior wellness program. Sometimes one of the frustrations of dealing with a sick pet is that you cannot simply ask him/her what is wrong. Therefore, Stone Veterinary Hospital has invested in the latest advanced diagnostic technology. When your pet is not well, we need to find out what is wrong. After performing a thorough examination, a series of diagnostic tests is often necessary in order to identify the medical condition. All the veterinarians at Stone Veterinary Hospital are knowledgeable and have a large amount of expertise in diagnosing and treating complex internal medicine cases such as kidney, heart, respiratory, immune-mediated and endocrine diseases. 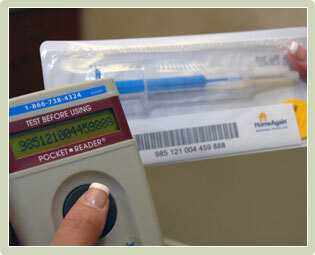 We use HomeAgain microchips, which can be successfully scanned almost anywhere in the world. Implantation of the microchip is painless and takes only seconds. After your pet has been microchipped, we perform a scan at each veterinary visit to ensure that the microchip is still present and readable. It's important to remember that a lost pet is not merely an inconvenience, it's the number one cause of pet death in the country. That's why we recommend microchipping every pet. All of these can indicate a serious dermatological or allergic reaction to allergens such as fleas, pollen, dust, and various foods. If you notice any of these issues, it is important that you bring your pet in for an evaluation because, if left untreated, they can become severe medical concerns. The word cancer strikes fear in all of us; however, with new advances in veterinary medicine, many pets are living longer with a greatly improved quality of life. Successful cancer treatment often lies in early detection. Early detection can be difficult at times as cancer may not only present itself as a lump on the skin, but may develop inside the body. If this occurs, a thorough examination with diagnostic tests (x-rays, ultrasound) can often discover the tumor. If left undiagnosed, the disease may not be noticed until clinical symptoms develop. Treatment also depends on the type and location of the cancer. If possible, surgical removal of the tumor is recommended. Some types of cancer are responsive to chemotherapy, which include a variety of oral and injectable drugs. Dogs and cats tend to tolerate chemotherapy well and do rarely develop side effects similar to humans. 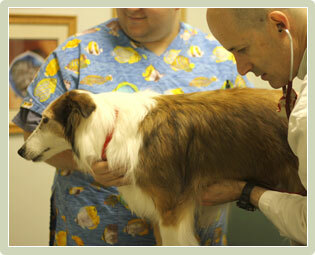 Our veterinarians are knowledgeable in this discipline. 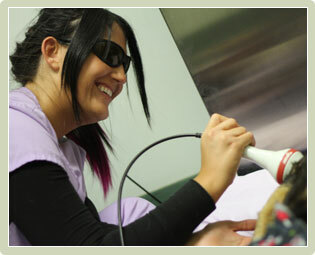 Laser therapy involves the use of specific wavelengths of light (red and near-infrared) to create therapeutic effects. Class IV therapeutic laser is a painless procedure used for post-operative care, treatment of arthritis, skin wounds and other selected conditions. Therapeutic lasers supply energy to the body as light is transmitted through the layers of skin and stimulates and accelerates the healing of damaged cells. Laser therapy causes no adverse effects on healthy cells. Laser therapy also decreases inflammation and eliminates pain, which allows your pet to quickly return to his or her normal activities. During each painless treatment, the energy from the laser increases circulation, drawing water, oxygen, and nutrients to the damaged area. This creates an optimal healing environment that reduces inflammation, swelling, muscle spasms, stiffness, and pain. As the injured area returns to normal, function is restored and pain is relieved. Your pet does not need to be sedated for laser therapy treatments and the experience is usually pleasant and comforting. Most pets do not need to have their fur clipped. Improvement is sometimes seen after the first treatment; however, most pets require several treatments to achieve maximum benefits. Generally, 4 – 8 treatments produce the best results and Class IV laser therapy treatments are cumulative. The length and frequency of treatments varies with your pet’s condition. Your veterinarian at Stone Veterinary Hospital will recommend a laser treatment plan specific to your pet’s condition. Stone Veterinary Hospital maintains a complete inventory of pharmaceuticals, vitamins, shampoos, flea and tick control products, and heartworm preventatives to meet the needs of your pet. We also carry a full line of prescription diets.